On November 25, 2013 IAIP organized the Charter Award ceremony in Mumbai to felicitate newly qualified Charter holders and the Level III pass outs. The chief guests for the event were Paul Smith, CFA, MD, CFA Institute, Asia-Pacific Region and Sunil Singhania, CFA, Board Of Governor, CFA Institute. 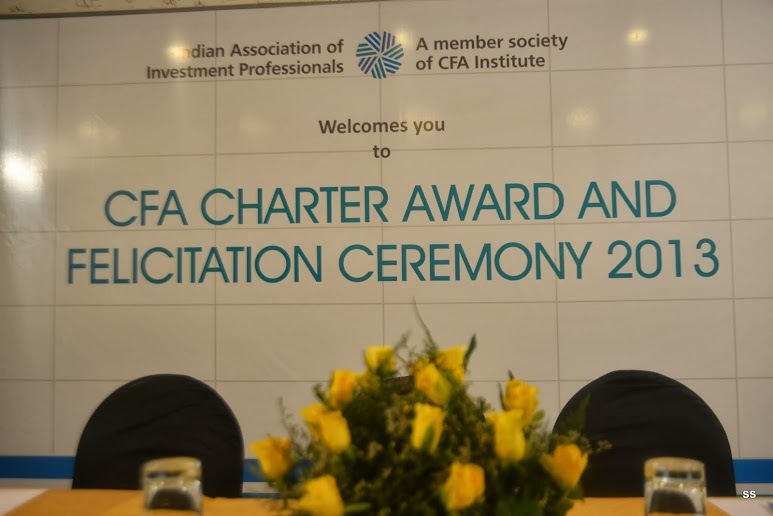 The event was well attended by new CFA Charter holders, Level III pass out along with their family member, the Board members of IAIP, the Committee Chairs, Vidhu Shekhar, Consultant, CFA Institute, Ms. Divya Sharma, Project Manager from U.K., CFA Institute and the members. Sanjay Parikh, CFA, Chair, Membership Committee, who anchored the event, described the growing popularity and recognition of the CFA designation and program in India. For June 2014 exams around 12,000 candidates have registered for all Levels of the CFA program in India and around 219,000 worldwide (180 countries). The membership base of CFA charter holders stood around 121,000 members in 142 countries. Both Sunil and Paul welcomed the new CFA charter holders. It takes a lot of hard work, perseverance and sacrifices of the family members to earn a CFA charter The future of investment profession is bright but facing some challenges currently. Recent surveys have shown that the Banking and Financial Institutions are two least trusted sectors globally. Sunil passed a strong message to newly qualified Charter holders and the Level III pass outs to never compromise of Ethics. Paul too reiterated the fact that Ethical conduct is the back bone of investment profession. Always place clients, firms and public interest first. Jayesh Gandhi, CFA, President, IAIP advised the new CFAs to take maximum benefit of online learning tools and webcast that are available on our website. Following this the awards were distributed by senior executives & members of IAIP. Post distribution of awards the recipients and also some of the family members narrated the journey that they have gone through and the character that they have demonstrated while pursing this program. They expressed their happiness and how contented they felt on successful completion of this program. They stated that content wise it is one of the best program of the world, how it changes the perspective of the finance professional completely and enhances technical competency on passing all there levels. This program is for the professionals who have passion for finance. This entry was posted in Celebration, Events, Felicitation Ceremony, Mumbai and tagged CFA Institute, Divya Sharma, Finance, IAIP, India, Indian Association of Investment Professionals, Investing, Investment, Jayesh Gandhi CFA, Jayna Gandhi CFA, Paul Smith CFA, Sanjay Parikh CFA, Sunil Singhania CFA, Vidhu Shekhar CFA. Bookmark the permalink. If somje one needs to be updated ith hottеst technologies then he must be go tto sеe thіs webb site and be upp to date daily.